"Through Pauline Oliveros and Deep Listening I finally know what harmony is….It's about the pleasure of making music." 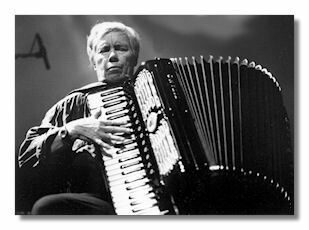 Pauline Oliveros, composer, performer and humanitarian is an important pioneer in American Music. Acclaimed internationally, for four decades she has explored sound – forging new ground for herself and others. Through improvisation, electronic music, ritual, teaching and meditation she has created a body of work with such breadth of vision that it profoundly effects those who experience it and eludes many who try to write about it. "On some level, music, sound consciousness and religion are all one, and she would seem to be very close to that level." Oliveros has been honored with awards, grants and concerts internationally. Whether performing at the John F. Kennedy Center in Washington D.C., in an underground cavern, or in the studios of West German Radio, Oliveros' commitment to interaction with the moment is unchanged. She can make the sound of a sweeping siren into another instrument of the ensemble. Through Deep Listening Pieces and earlier Sonic Meditations Oliveros introduced the concept of incorporating all environmental sounds into musical performance. To make a pleasurable experience of this requires focused concentration, skilled musicianship and strong improvisational skills, which are the hallmarks of Oliveros' form. In performance Oliveros uses an accordion which has been re-tuned in two different systems of her just intonation in addition to electronics to alter the sound of the accordion and to explore the individual characteristics of each room.